I've decided to use it as a mobile pen-testing device. This page will be a collection of my notes on how to install and run hacking/pen-testing software with the n800/n770/n810. This page is a very rough draft for now, I plan to update it as I have more information to convey. When the installer asks what firmware to use, point it at the bin file you downloaded from Maemo.org. Everything else the installer should walk you through. For the record, I'm using SU-18_2007HACKER_4.2007.36-2_PR_F5_MR0_ARM.bin. Notes: I've put this up despite it not having packages. Notes: I modified this to work on IT2007, mostly just for Kismet. Notes: A metric ton of apps. 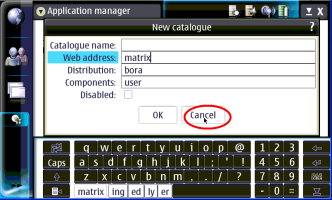 Xterm is a must for the comand line apps. Notes: MUlliNER.ORG seems to have more security apps than anyone else. Notes: Even more good stuff. 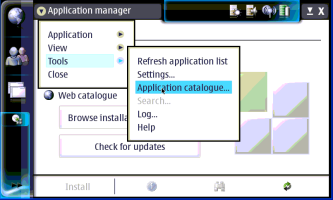 Once the repositories are set up you can install apps using the Application Manager and let it take care of the dependences for you. Just choose "Browse installable applications" and go through the alphabetical list, or use the binoculars icon to search for the package you want. 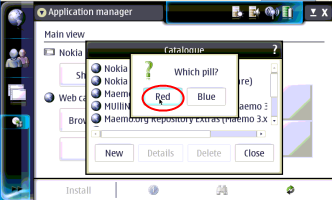 It should be noted that to install some packages you will have to be in "Red Pill" mode. If you ever get an error that says you can't install something, put your tablet in "Red Pill" mode by going to add a new repository, typing just "matrix" in the web address line then hitting cancel and choosing Red as show in the screen shots below. 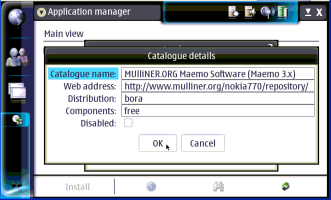 If you want to find even more software for you 770/800 check out http://maemo.org/community/wiki/applicationrepositories/ . 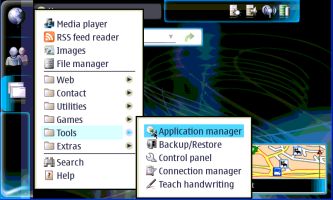 Using the above repositories you should be able to add pen-testing apps like Nmap, Kismet, Netcat and others. For some apps like Kismet a Nmap, to get the full functionality you will have to become root. The easiest way is to drop out to a command line using Xterm and type "sudo gainroot" then use use whatever apps you like. That's it for now, more to come later. I'm still working on getting it to run on the n770.